Bridal designer and stylist-to-the-stars Kate Halfpenny unveils her new pre-Raphaelite-inspired collection and offers some sage dress-shopping wisdom. What led you from styling to designing bridalwear? I've always been inspired by bridal fabrics and dreamy silhouettes, so what better way to channel this obsession than creating stunning wedding dresses? Also, it's wonderful working with incredible women to make their dreams come true. What inspires the Halfpenny London collections? I take a lot of inspiration from the fabrics I use, and art. My latest collection is inspired by the British Pre-Raphaelite artist John William Waterhouse's paintings – the ethereal emotional pictures set in the countryside with lots of florals offer such strong, feminine images. Who is the Halfpenny London bride? 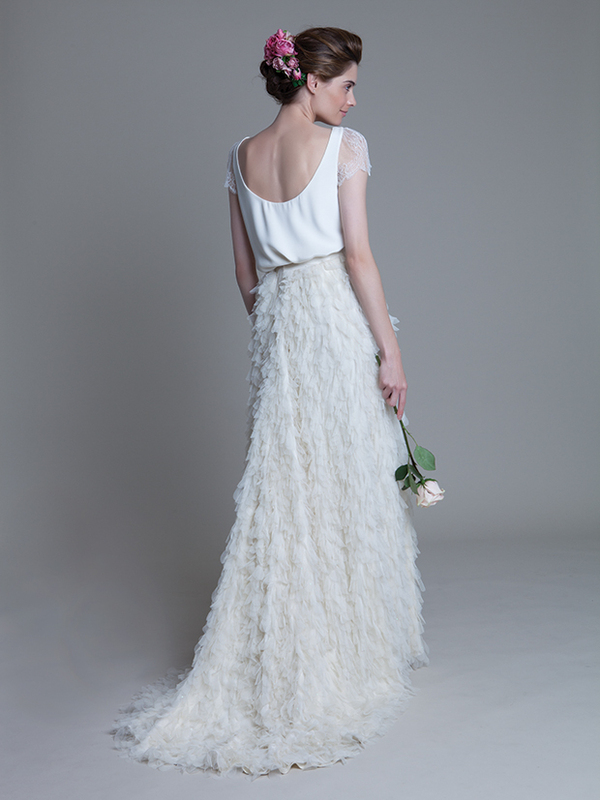 The Halfpenny London bride is no individual bride – she's many different women, as we have a really diverse collection. What I can say is she's definitely is looking for something different, something effortlessly chic, elegant and stylish. What does every bride need to remember during a fitting? Don't stand rigid at the mirror, focusing at parts and elements of the dress. Instead, move around, seeing how the fabrics move. Remember the dress needs to work for you and your body; don't buy dresses that aren't cut for your body shape. What dresses suit different body shapes and sizes? A full circle skirt is great if you have curvy hips as it floats right off them, but is also good for you if your figure is straight up and down as it can give you an illusion of curves. A cowl neck is both great for a bigger bust and again good to hide a smaller bust. Both of these figure-fixing design details feature in my Clare dress. Bridal blogs and magazines are a great place to start pulling designers and styles and ideas together. Do your research and find out which boutiques hold the designers you like. It's such a waste of time if the style of the boutique's designers isn't you. Try dresses on that are out of your comfort zone. You never know what might just float your boat. Make sure you know what's included when you buy your dress. Are alterations and fittings included? Do they do them in-house? Some designers just sell you the dress and you have to go to get it fitted elsewhere. Don't feel any pressure to make the purchase on the first day. You're not buying a washing machine. Ensure you have at least six months before your wedding as it can take a minimum of 12 weeks to have a dress ordered from a designer, and you would definitely need longer if you're commissioning a bespoke piece. Don't settle for second best. There is a perfect dress out there, you just might not have found it yet.